Are you searching greeting card making software to craft printable greetings cards for your friend, mom, dad and other family members? Greeting card software is devised with different image designing tools like pencil, line, text, rectangle, ellipse, triangle, pictures and star objects to fabricate premium quality personalized greeting cards. With secure greeting card designer program you can design homemade, user desired greeting cards in different shapes including rectangle, ellipse and rounded rectangle. Greeting card designer software provides interactive way to create greeting cards. You can design bulk greeting cards with the greeting card designer software to gift thousands of users simultaneously. ▣ Greeting card designer software generates eye-catching greeting cards. ▣ Simple to operate greeting card designing software provides advanced color and background settings to design greeting cards. ▣ Greeting cards can be crafted in different shapes and sizes as per the user requirements with greeting card maker software. 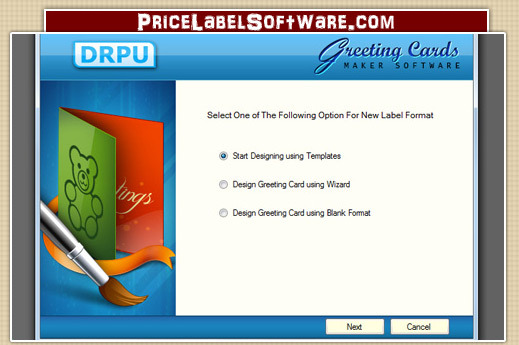 ▣ Greeting card creator utility is developed with advanced printing settings to print created greeting cards. ▣ Multiple greeting cards can be designed by the greeting card maker software.